I watched Spider Man 2 this morning. Super heroes get away with being masked men and women. Protecting your identity does indeed protect those you love. If you are a super hero. If you intend to become a professional blogger, hiding away is the last thing you want to do because if people cannot see you as you are, something seems fishy. Would I wear a trash bag over my head if we met on business at Starbucks? Probably not. Unless donning trash bags becomes the “in” thing. Having spent 2 weeks in NYC early last month I don’t see the trend picking up. Now I’m living in Doha, Qatar for the month with my wife Kelli. We saw some wicked wind storms earlier this week. Fabulous for branding in terms of videos and pictures. Not so hot for my sinuses. I have to wear a surgical mask to keep out pet dander and dust and particulates for a few days to allow my system to find equilibrium with the dry, dusty conditions of the Middle East. Wearing a mask clued me in to this blog post idea. Now that you have an idea that hiding away can kill your chances at being a successful blogger let’s discuss how you can inspire your audience to trust you. Oh yeah; you want readers to trust you because all meaningful connections are rooted in trust. All blogging success roots itself in meaningful connections. See me in the video above? If you wanted to learn more about me as a blogger you would be a little wary about some guy who runs around wearing a surgical mask. Unless he was removing spleens or creating humorous, informative blogging videos. Do not hide your face. Ever. Post smiling head shots on all of your social media accounts. Be transparent. Allow us to see you so we can form a strong human connection with you. Scrap the shadowy photos and cartoonish avatars if you want your audience to trust you easily. Showing your face is one thing. Ratchet up your “here’s my kisser” campaign by posting selfies to your blog and social media accounts. I have a *little bit* of experience in this area. OK. I have snapped and shared 347 million selfies during my blogging career. For good reason. My friends love me. My readers want to see images of me from locations all over the globe. Both because they dig seeing me and because many visualize themselves in my position when they see me, living their dream vicariously through my meat suit. We want to trust you. I respond to all comments on my blog because it’s fun and I enjoy showing love to folks who show me love. I like to listen. So I can help. Responding to all comments gives readers a reason to connect with you deeply. Proves you’re listening and that you care enough to both read and respond to every individual who shares their thoughts on your blog. I am a chatty guy on Twitter. I engage on Facebook. I know the secret sauce of successful social (say that 5 times quickly): being social simply makes it easier for people to trust you quickly. I am words on a screen until I post a few selfies. I am blog posts and eBooks and audio books until I respond to comments on my blog. I am just some internet persona who snaps selfies in exotic paradises around the world until I chat with folks on social media. Spend 10 minutes a day Liking and commenting on Facebook updates from your main stream. Retweet and engage fellow bloggers on Twitter. Being active on social media makes you human, engaging, trustworthy and sets the foundation for a hyper successful blog marketing campaign through social media. I give away a free blogging eBook every Friday at Blogging From Paradise. If you want in on this, sign up here. I wrote 126 eBooks. So I give away one for free, for 24 hours, every Friday. Some are inspirational, most are blogging, all have my Blogging From Paradise brand stamped all over them. Literally. Giving people free stuff inspires them to trust you because they won’t feel like you’re trying to manipulate or coerce them. I also created 4 blogging courses in addition to my 126 eBooks and 30 plus audio books and paperbacks. Creating all this helpful, premium content inspires people to trust me because whether you help someone for money, or free, if you help with love you are being a servant. If you see me as a servant with your best interests at heart you will trust me. This one may confuse you. But if you impress this idea on your mind – like a farmer brands cattle – you will allow people to trust you easily. You do not need to earn trust. You do not need to gain trust. Here’s why: you are whole and complete, as is. Meaning, if you will just be transparent and open and genuine and authentic you will attract readers who trust you implicitly the first time they visit your blog. I sometimes offer the advice trust needs to be earned but really, as you toy around with this idea, everything you see on the outside reflects your inner world. Which is why some bloggers attract hoards of trusting readers quickly. They trust themselves and love themselves so they are transparent and you betcha readers reflect this vibe back to them in the form of trusting them quickly. If you enjoyed the eBook please review it on Amazon. Hard work is necessary for creating a attractive blog.you must to know about how to describe your information in the front of user so people know easily. I love having fun, creating and connecting. Keep at each persistently and good things will happen with your blog. I don’t know why but I hardly get my face clicked. 5) is I am not working on it at all. Seriously I am not because I don;t have anything yet build up but do have some plans and was waiting for some important things to get done in my life. Thank you, buddy, for this great cover of the topic! Being transparent, stick to your interest and finding the fun out of what you do; you’re on the right track, buddy! Really, you have a sweet little free giveaway in the making on your blog. All you need is 1 awesome free giveaway and you’re good to go. That’s the super DOOPER quick and awesome idea, buddy! Cool dude, looking forward to seeing what you got! My whole thing is to inspire, to better people, and to better myself forever in this thing that we call blogging, this thing that we call internet marketing. I too intend to spread the love while growing as an individual. As we give, we grow. How neat. What a blessing. Your topic lends itself to instant engagement. Awesome-ness. This benefits you and your audience so that trust builds pronto. It’s really nice to see you on Enstine’s blog, thanks for contributing the great content for us! You know, how we are engaging the readers would help us to get better search engine rankings. So, we must inspire the readers through the helpful content and treat them kindly with freebies. I love the idea of Selfie mad, will do it. I follow the other things that you have listed here. You always motive me to write the brilliant matters, keep doing it. Nirmala Santhakumar recently posted…GreenGeeks Vs InMotion Hosting – Who Is the Winner? Chatting is big. Just a few second engagement here and there does wonders for our blog, and for search engine rank too. Google wants to bring the world together. I always tried to replay each and every comment on my blog, so its give a better chance to get readers trust and its very simple. Give away is more better to get readers trust very effectively. I dig that idea bro; replay in mind to give freely, spread love and make a bigger impact. I tend to re-view my comments before publish to see I left some heft. This is powerful, indeed, Ryan. You don’t need to earn trust from others IF you just trust yourself. Others will see that, and follow you for who you are, transparent and loving, and always ready to engage others on a human level. So glad you invited Ryan to share this advice with your readers, Enstine. So happy to see you energized and blogging! You and Donna do such a good job in trusting yourselves; your loyal followings just mirror back that level of self-trust you maintain. Always love to read your posts, Ryan. Thanks for having him on your blog, Enstine! Good to see you here and thanks for stopping by to interact with Ryan. Good to see you here. To be upfront you are really Marco Polo of both online and offline world of present times. Last week I saw you on Zac’s blog, the other day on Jane Sheeba’s blog and now here on none other than Enstine’s blog. When you are honoring me to welcome you on my blog. Seriously. It is right that without being real we can be a business person to achieve our online goals with a static website but to be really a personal blogger we equally need to be personal and damn personal to create trust in hearts and minds of people for us. Every tip you shared here has a monumental value to inspire your readers to trust you. Many thanks for sharing your wonderful ideas with pleasant wind from your paradise. Have an incredible day mate. Good point on that static site versus a blog. We let our personality through when we have a blog and open up. I will take you up on that Mi. I’d be happy to write a guest post for your rocking community. Thanks a bunch. What’s up buddy and how is the year picking? Ryan, I totally agree with you. The only thing I’d add is to share more of your life experiences with others. People LOVE it when you do that — even if you share the “bad” stuff. Before I was a freelancer, blogger, and author, I was a teacher who quit teaching and became a drug-addicted prostitute. I’m also a single mom… and my son is mixed-race (half Spanish, half “white”). I was also raped when I was a 14-year-old virgin. When I decided to share my life story/experiences online, I NEVER IN A MILLION YEARS thought that others would find me INSPIRING! I thought I’d be judged. And hated. And shunned. Instead, the opposite happened. I was given sympathy, called “inspiring,” and welcomed by so many people. I even gained a following on social media! So being “transparent” should include the bad stuff, not just the good points in your life. I’ve learned that if you share the negative stuff, people will like you even more, because you are being REAL. And that inspires trust more than anything! Fabulous. Because sharing the whole story – nightmares, dreams, wins, losses, the whole shebang – mirrors so many other folk’s lives. I recall meeting one of Kelli’s offline buddies a few years ago. She noted how it felt tough for her to connect with us sometimes because we had little in common. She did not follow my blog so it was like someone who works the 9-5 trying to connect with someone who island hops and blogs and stuff. 2 different lives. But people who read my blog and follow me on social learn the REST of the story, and can connect with my wins….and losses. So glad to see you here having fun with Ryan. It is an amazing post. making a trust for readers is not easy these days. But one has to stand in the marketing then it is an important factor. Robin Khokhar recently posted…Domain Authority vs. Page Authority. Thanks much for reading bro. Thanks for coming over to have a chat with Ryan. Awesome tips to inspire readers. And you are utterly right about giving freebies to readers which will eventually gain more trust. What a simple way to build bonds, right? Give free, give premium and your blogging presence grows. I have a somewhat new blog, how can I get new visitors instantly? I loved the giveaway trick, as I have seen many bloggers doing that.But I still don’t have that much of large fund to start giveaways, what can I do? I also like the rest of the tips too. But I want to get a free give away fast. Create your own free giveaway. This builds instant trust which equals instant traffic 🙂 Or, when you create something valuable, people will seek you out, giving you traffic. A 10 page PDF giveaway works nicely. Solve some problem from your niche. Well said Ryan, being transparent to my readers is something have been thinking about for a long. I was just confused till date. Well, you boosted up my confidence level and showed me the right track as well. Thanks for your effort. Absolutely awesome dude. So happy to see you opening up to be transparent. May be uncomfortable at first but over time wow does it make the blogging journey easier. Think abundance! The more you give freely, the more easily you receive. You cannot lose. Honest. But you gotta explore that belief in scarcity/loss and let it go to allow people to trust you. As an affiliate marketer, I must inspire my readers to trust me which will lead to future conversions. You have shared some great tips to do the same and inspire our readers. Every reader is special and every reader should feel that too. Perfect bro, perfect. Every reader is special. Treat each with love. Trust is yours. What an easy way to allow readers to trust you stupid quickly. Nice post. I will surely try one of these methods. I think: “Give away a Lot of Free Stuff (in Addition to Premium Products)” is one of the best method which i am going to try it on my blog. Thanks for this wonderful post. Both actions are abundant. For free AND premium content. Because some bloggers cling to limiting beliefs around money and automatically devalue their premium/paid offerings, from courses to eBooks, being afraid to offer these products and services freely. Nice article, You can’t negotiate on trust. Reader don’t buy from businesses — they buy from people that they trust. If you want to reduce your bounce rate then you need to work on improving reader trust. I dig that add; we buy into other human beings. Which is why smart guys like Mark Z and Richard Branson wove themselves into their company brands. A face, a human, behind the business. Trust should be the first thing on our minds when it comes to our readers. As you mentioned, one great way to do it is to be more transparent. Especially when it comes to your photos. I’m not big on taking photos and sharing them, but at least I have a few on social media so that I don’t appear too mysterious and untrustworthy. Great post Ryan! Have a good one! You do such a smash up job being transparent through your writing; A+ in that department which I know allows readers to trust you. Adding photos can help with being transparent but again, the clarity and honesty with which you share your blogging story oozes trustworthiness. You’re only trying to be…..you! Definitely an informative post, indeed! We have to know how to engage readers in our blog and make them stay long time! Anyway, great points you have explained! Giving away helpful content for free helps you detach from outcomes, aka, trying to make money. Bloggers detached from outcomes – largely – quickly and easily allow readers to trust them. No big mental blocks around giving freely or receiving. 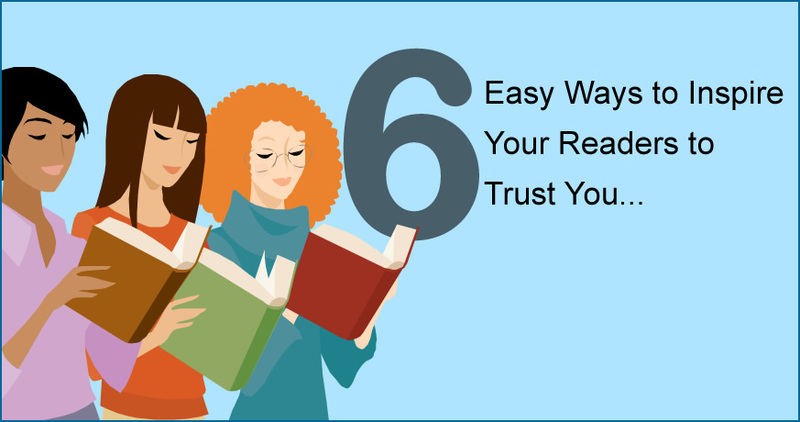 I like your tips to gain our reader’s trust.Trust is the first thing for readers.very nice post. Anyway, keep sharing such kind of great post always. Getting trust is one of important task in relation building via blog. I would try all the points mentions here, but I will start with giving away stuff to reader for free.